From space, cities can look like microscopic living organisms, with bright nodes of industrial and civic activity connected by circulating routes of traffic and transport. Some cities are taking this analogy to a new level with an “urban metabolic” approach to planning. Inspired by the complex food-to-energy process of living organisms, the urban metabolic approach attempts to harness the output of one urban system, like solid waste management, to fuel another, like electricity generation. Since cities consume 75 percent of global resources, some experts see this lifecycle perspective as crucial to global sustainability. One city embodying this approach is İzmir, Turkey. The historic city on the Aegean coast has shown remarkable progress in opening up its public spaces to pedestrians and instituting sustainability goals. With the support from Dutch Creative Industries, WRI Turkey Sustainable Cities, the architecture and design company FABRICations, and the City of Izmir are working on a project to combine city cycling infrastructure with tourism, waste management and logistics services. One of the goals of the project is to produce maps showing pedestrian and resource flows throughout the city, which will feed into the city’s masterplan. Using the urban metabolic approach, the hope is that İzmir will not only ensure better infrastructure for its more than the 35,000 daily cyclists, but also provide better and more efficient services to business owners. The city can reduce the cost of various types of infrastructure and services through integrated, long-term planning. The urban metabolic approach encourages thinking through the whole lifecycle and general use of infrastructure, which results in fewer renovations, excavations and updates. With more bikes on the road and fewer cars, these initiatives can also decrease traffic, reduce air pollution and lower commute times. The Dutch support for this work has emerged in part because the city of Rotterdam is a leading example of urban metabolism in action. Project Atelier Rotterdam, a collaboration between the Municipality of Rotterdam and the International Architecture Biennale Rotterdam, mapped the flow of various resources in and out of the port city: goods, people, waste, biota (plants and animals), energy, food, fresh water, sand, clay and air. While most of these flows are separate from one another, the project team devised a strategy for the city to employ a circular economy, integrating some flows with each other to increase environmental and economic performance. Collecting resources from waste and food, including aquafarming to harness phosphate runoff, protein harvesting for urban farming inputs and trading in e-waste at the supermarket. Creating more natural infrastructure to increase water storage, utilize the green space under high-voltage wires and encourage oyster banks along dykes. Channeling waste from energy generation to heat homes and capture, store and re-use carbon dioxide. Catalyzing re-industrialization through a new multi-modal transport network, distribution hubs and remaking three boulevards to encourage mixed business, residential and tourist uses. The project has made an impact on the Dutch government at various levels. 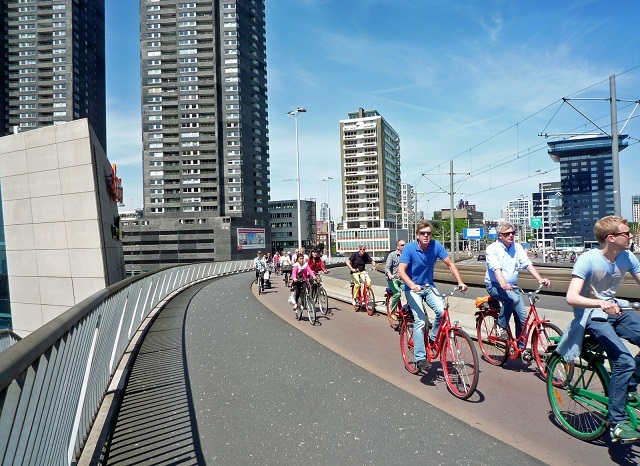 To reduce motorized freight traffic through the city center, Rotterdam is building a new, multi-modal inner ring road, the e-loop, which connects major transport hubs. Three cargo hubs will connect the e-loop, road network and waterway where goods can be distributed through a network of boats, bicycles, electric delivery vans, cargo lockers and pick-up points. The e-loop will not only form the backbone of goods distribution but make it easier for people to get around (the vision is that most will travel via small-scale electric vehicles) and create social hubs around major transport centers. 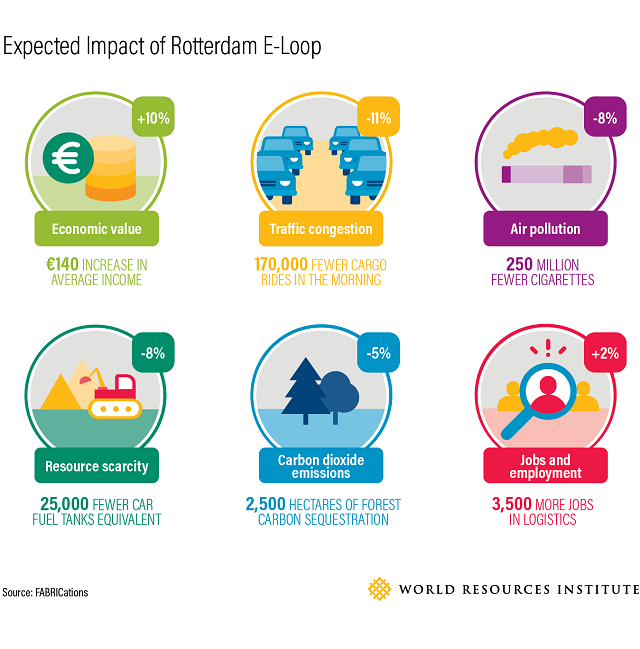 In all, the e-loop is expected to provide substantial social, economic and environmental benefits to Rotterdam, including reduction in the use of raw materials, carbon dioxide emissions and congestion; improvements in air quality; and new jobs. 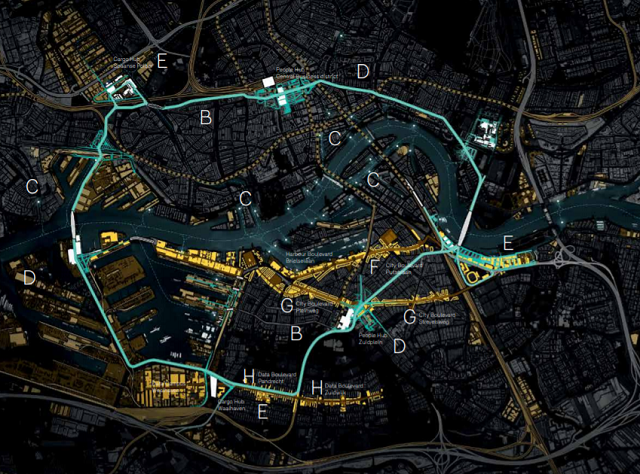 Rotterdam’s extensive mapping of resource flows and İzmir’s budding metabolic cycling network show the potential for this new approach to urban planning and design, one that regards cities as living bodies. There’s much that cities around the world can learn from these projects and their methods of re-using, recycling or otherwise harnessing resource outputs and feeding them back into the urban system. Çiğdem Çörek Öztaş is Urban Development and Accessibility Manager at WRI Turkey Sustainable Cities.